Beautiful! And a great message. Hey Krista! First of all… I am totally in love with your holiday header! Santabulous! First of all…. Oh I already did a first of all… :o) Second of all (just doesn’t have the same ring to it) Thanks for dropping by. I love your little dialogue between Groucho turkey and the security guard. you should be a script writer. And last but not least…. You are so sneaky! 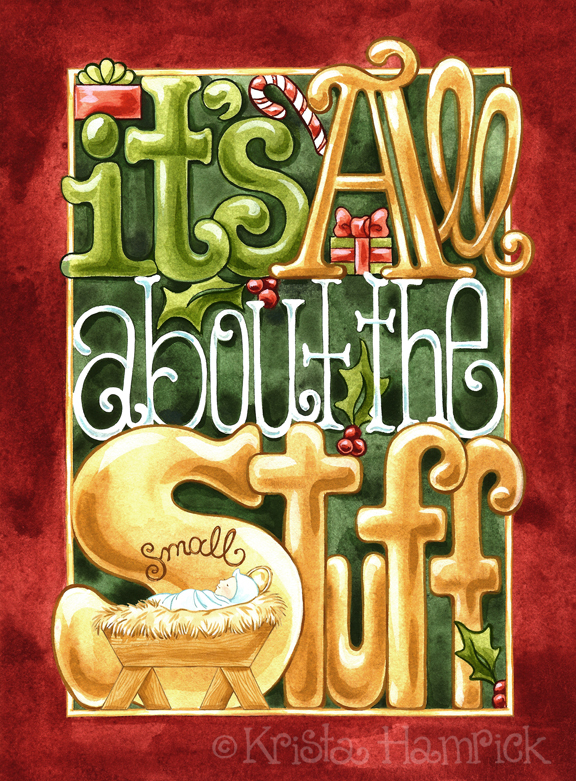 I was so enthralled in the beauty of your lettering and the festive colors… I almost looked right past the greatest gift! You are a sneaky genius! Love this!!! God bless and Happy Thanksgiving!!! Oh, that is deliciously sneaky on several levels! At first I was thinking about Santa being sneaky, and then I see the true meaning of Christmas sneaking in. Brilliant and beautiful! Oh, Krista, I do hope you were able to save your friend’s antique dresser. Eeek! I would definitely have panicked! The lettering and illustrations work beautifully together! Beautiful, love the Christmas header too! Beautiful! Your characteristically lovely lettering is perfect as usual! I love this card. It’s so festive and cute. Just when you think it’s a materialistic joke you see the hidden manger. Very nice! oh this is such a sweet card!!! I love it….and the words ring so true….thank you for the reminder Krista!!! !